PLC’s at Work Institutes – MasteryConnect Presenting! MasteryConnect has been invited to present at the upcoming Professional Learning Communities at Work Institutes in New Orleans, St. Louis and Las Vegas! We are extremely excited to be part of the Institutes in these amazing cities. Trenton Goble, MasteryConnect’s Chief Academic Officer and an 18-year veteran teacher/principal, will be discussing PLC implementation strategies after Dr. Rick DuFour’s morning keynote on the second day of each conference. Not surprisingly, the presentations in St. Louis and Las Vegas are already SOLD OUT! But there are still a few spaces for the Institute in New Orleans on June 4-6. If you want to snag the last available seats, make sure to register by May 31, 2012. If you’re already registered for one of these events, we look forward to seeing you there! As a part of our ongoing effort to address teacher needs and make the Learning Community more engaging, we recently released some updates to MasteryConnect. By way of practical updates, we have beefed up our export options when exporting to a CSV file or to Excel. We hope this additional functionality helps as you wrap up end of year and administer district benchmarks. Now onto the fun stuff: we added a killer, time-saving Facebook button for getting a profile photo. When adding a photo to your MasteryConnect profile, you have always had a few options. You could upload a photo or take a quick picture using your webcam. But now (drumroll please) you can also choose to pull your profile picture from Facebook! 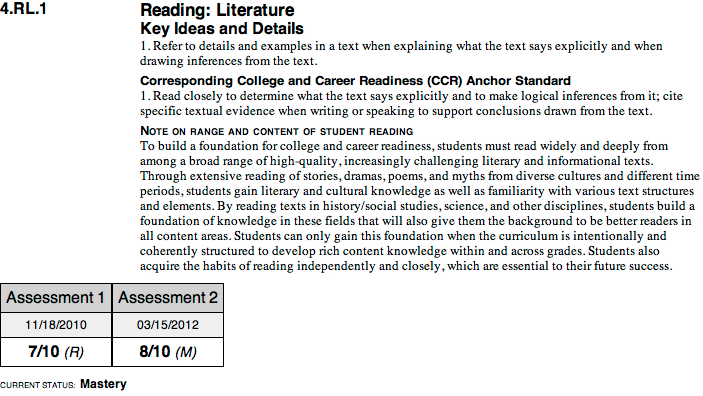 Last but certainly not least, you can now view common assessments on the iPad. With new HTML 5 compatibility, you can now explore the community of assessments from the iPad or other mobile devices. This is very exciting for those of us at MasteryConnect who are addicted to our iPads! We hope you enjoy the increased viewing flexibility as much as we have. We don’t want to spoil the surprise, but there are big (and extremely exciting) additions coming soon to MasteryConnect. This blog was just the opening act for upcoming changes as of June 1. Stay tuned and keep on tracking! MasteryConnect recently sat down with Kevin Rich, an English Language Arts teacher at Lakeridge Junior High School (a model DuFour School). Kevin shared his thoughts with us about how he’s using MasteryConnect at his school. As an ELA teacher in a mastery-based school, Kevin possesses unique insight into formative assessment approaches for Language Arts and implementing the Common Core. Kevin outlined three ways he’s using MasteryConnect in his classroom. This is just a snippet; the actual paper that parents receive has the student’s name, many more assessment results, and related objectives. In addition, I send parents a link where they can see their child’s assessments, which are attached to core objectives. The link lets parents see the test, the questions their student missed, and how the rest of the class (no names attached) did on each question. Yup, we do more. Much more. MasteryConnect is a fantastic tool to become familiar with the new Core. It displays the standards in a more concise, orderly, and simple way than any printed handout I’ve ever seen. The other thing MasteryConnect allows me to do is organize the Core in a way that actually makes sense. It becomes very difficult to teach and assess the Core if it is presented in a hierarchical format. Good teachers don’t always teach in the exact order in which standards are labeled. For the first twenty minutes, you might be addressing the literature part of the Core, then the speaking components, then writing or language, etc. It becomes a pain to see how your day went if the Core isn’t organized to mirror how you teach. But you can re-organize for your day, your unit or even your year. It becomes easy to chart your progression through the Core in a way that makes sense. I imagine all teachers have heard the term “backward design” at some point in their careers. The idea is that the teacher establishes where they want their students to be and then work backwards to figure out how to get students there. With the new Core, it becomes easier to figure out exactly where the destination point is. If we say ‘understanding metaphor’ is the objective, well, that can be very shallow and simple, or very deep and time-consuming. One thing MasteryConnect offers is access to other peoples’ assessments from across the network of Common Core states. This allows me to collaborate with like-minded teachers, view the level of rigor in their assessments, and determine where others expect their students to be in relation to a standard. As an assessment junkie, I confess I have spent hours surfing assessments from all grades. There are some really good ideas out there.